NIZHNY NOVGOROD, Russia (AP) With two penalties and an accidental deflection, Harry Kane moved ahead of David Beckham and Cristiano Ronaldo and put England into the round of 16 at the World Cup. Kane scored half of England’s goals Sunday in a 6-1 rout of Panama, the national team’s largest-ever margin of victory at the World Cup. ”The third one is probably one of the luckiest ones of my career,” said Kane, who took the game ball to the locker room. ”Sometimes you go through spells where you are scoring and sometimes it doesn’t fall for you. Kane has scored a tournament-leading five goals at the World Cup in Russia, one more than Ronaldo and Romelu Lukaku. He also has 18 for England’s national team, one more than Beckham. Not since the 4-2 victory over Germany in the 1966 final has England scored as many goals at the World Cup. 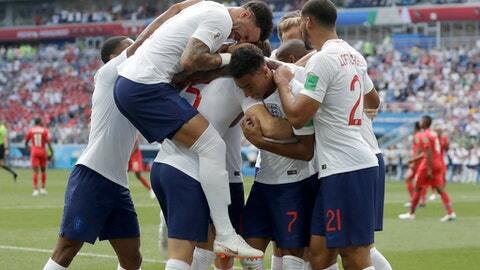 The ruthlessness of the display in the sweltering heat of Nizhny Novgorod showed just how far England has been transformed in the four years since an older, more experienced squad couldn’t even manage a win when it exited the World Cup in the group stage. In 2014, England complained about the heat in Brazil – particularly the humidity of the Amazonian jungle in the team’s opening loss to Italy. Kane scored two in the opening 2-1 victory over Tunisia, including a header in injury time. Now England is sure of a spot in the round of 16 with a game to spare in Group G. Panama, which offered little resistance, is leaving the tournament early after being eliminated along with Tunisia. Sterner tests await, starting with the Thursday’s game against Belgium. England and Belgium are level on points and goal difference and will play for first place in the group. England showed it wasn’t only reliant on Kane, who couldn’t find the net at the 2016 European Championship. John Stones headed in two goals and Jesse Lingard curled in another. The egos who dominated in England’s celebrity-obsessed, underperforming Golden Generation in the first decade of century have gone. The joy and togetherness in the squad – the second-youngest in Russia – becomes clear in the goal celebrations. England picked up where it left off in Volgograd, with a corner from Kieran Trippier headed into the net in the eighth minute. It wasn’t Kane on the end this time but Stones, who was left unmarked to score his first international goal. Kane didn’t have to wait long to add to his tally, converting from the penalty spot in the 22nd after Lingard was brought down by Fidel Escobar. The fourth goal was the culmination of a well-worked free kick with Sterling’s close-range header parried by goalkeeper Jaime Penedo. Stones was primed to follow-up, giving the defender his second. However much they tried, Panama struggled to block England’s route to goal. Anibal Gody resorted to trying to wrestle Kane to the ground, only to concede a penalty that was converted by the Tottenham striker. Chasing the golden boot, Kane relied on his heel to complete his hat trick by getting the faintest of touches to divert Ruben Loftus-Cheek’s shot into the net. England completed 25 passes in the buildup, the most in any World Cup match since 1966, according to Opta. England could afford to ease up and preserve energy but it cost the team first place on goal difference. Felipe Baloy slid to meet Ricardo Avila’s free kick and score Panama’s first World Cup goal. Panama, beaten by Belgium 3-0 in the opening game, finally had something to celebrate, albeit briefly. England had spells of sloppy defending that could be punished by stronger teams, like Belgium. But by taking their chances and exploiting a porous defense, England showed what it is capable of. The winner of the England-Belgium match on Thursday in Kaliningrad will win Group G. In the event of a draw, first place could come down to the fair play record – which team has accumulated fewer red and yellow cards.